As a researcher, I keep a database of scientific papers I have read. This is stored in BibTeX format. 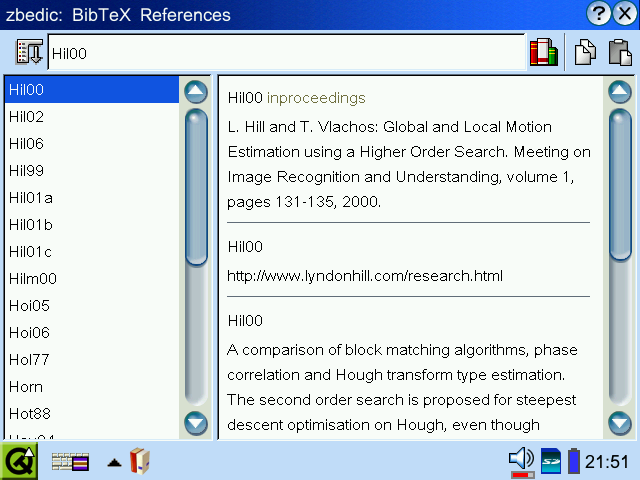 BibTeX is an extension to the LaTeX text processing language; this is a system used by many researchers in many different fields. Every time I read a paper I type up a few notes about what I thought were the important features and key contributions of that document. This is useful to remind me what the paper was about and is a skeleton for any literature review I might need to write later. I keep these notes in a simple ASCII file with the filename being the BibTeX citation key. I have written a script to convert my BibTeX file to bedic format, as used on my Sharp Zaurus for zbedic and also qbedic on the desktop. My Perl conversion script is freely available here for you to use for whatever purpose you wish; I make it available under the GNU GPL v3.0. The script is tested with Linux, you may hack it to work on another system. The script picks out the title, author, year etc and formats that in bedic style. It also picks out the URL and adds the notes (if they exist). You get quick and easy reference to your document database, notes, etc. The only drawback is that you can only search by citation key (bedic is a dictionary format so you can't expect everything). 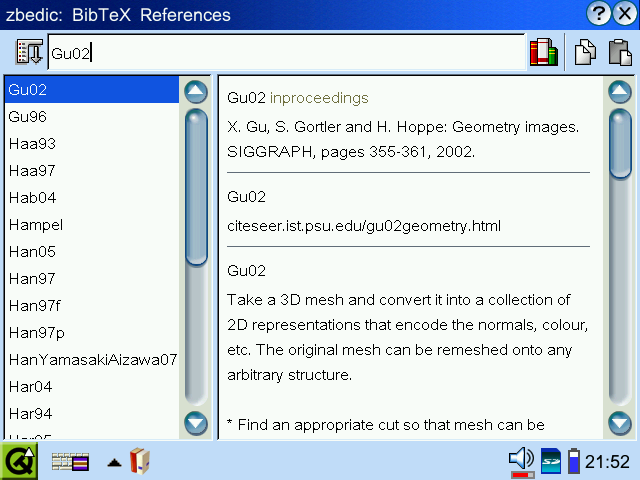 Here are some images from browsing my BibTeX files. There are some parameters you will need to edit. You set the directory containing your bib files and the location of your notes. All bib files will be picked up and used. Please bear in mind the script is quite simplistic and relies on a reasonably simple and correct BibTeX file being input. This is not a parser. The script will read in all bibliographies in the given directory and process them. If you want to make sure your abbreviations are properly expanded, please make sure they are read before they are used in your bibliograph file(s), I put mine all together in a file called abbreviations.bib and make sure no other BibTeX files will be read first. The script outputs bedic's simple format. You will still need to compile it with mkbedic and compress it with dictzip (optional). Those tools are part of bedic and dictd projects respectively.